For someone with frailty, simply getting up and down out of a chair unassisted utilizes muscles that will benefit from movement. First focus on individual goals, concerns, and any barriers standing in the way of exercise. Exercise in brief, 10-minute sessions. Set a schedule. It’s important to reserve particular times each day for exercise, making it an integral, regular part of the person’s daily schedule. Make sure the senior is wearing comfortable clothes that won’t restrict movement. He or she can also wear leg warmers or over-the-knee socks to help prevent sore muscles in the lower leg. If any movement results in pain, stop immediately. 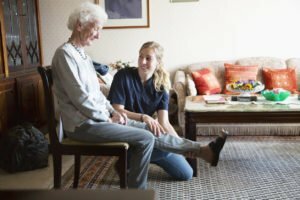 Regular exercise is a vital part of daily life for people of all ages, and Hired Hands Homecare of California can help your senior loved one exercise at home and achieve a whole new lease on life with regular, safely monitored activities. By providing encouragement, and even participating in exercising with the senior, increasing activity levels becomes something he or she will begin to look forward to and enjoy each day. Contact us at 866-940-4343 to learn more and to get started on improving wellness for your senior loved one!